41 fours, 21 sixes and an enormous 481 runs. This was the story of the last match between AUS vs ENG. In Today’s Dream11 Fantasy Cricket Match Prediction of ENG vs AUS 4th ODI, we will cover who will win, probable playing 11, fantasy cricket news, toss prediction and pitch report of Riverside Ground, Chester-le-Street. Who Will Win the 4th ODI Match, Between ENG vs AUS and Toss Prediction? Where Can You Watch the Live Streaming of ENG vs AUS, 4th ODI or Channels to Watch? What is the best combination of players for Dream11 and Fantasy Leagues for 4th ODI Match? Australia lost their last four matches back to back against England, they lost three matches in this series and one in January 2018. Australia will be desperate to win the 4th ODI. On the other hand, ENG will try to move one step ahead to make it a complete whitewash. According to our astrology prediction, ENG will win the match. The team winning the toss should bat first as the setting a target on the board and defending it would be a wise choice. Chasing is a bit difficult on this ground. According to our astrology prediction, ENG will win the toss and they will ask AUS to Bowl first. Date: The match will be played on 21st June 2018 (Thursday). 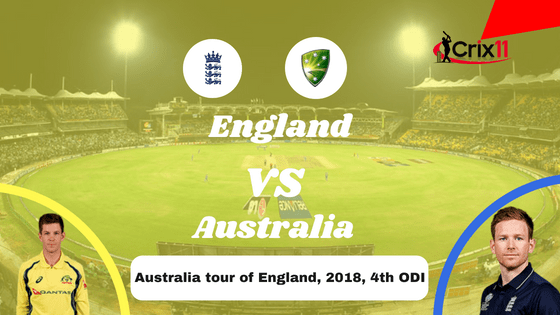 Match: Australia tour of England, 2018, Eng vs Aus, 4th ODI. Time: 01:00 PM GMT, 06:30 PM IST and 02:00 PM Local. The pitch of Chester-le-Street, Riverside Ground will favour the batsmen. The last three matches played here was a high scoring game. The fast bowlers will also get some help from the wicket. If the batsmen manage to handle the swing and movement in the initial overs, then they can score big runs. The spinners will enjoy bowling in the middle overs as the spinners will get a turn from the wicket. Note: If you know how the pitch will play, then you can select your team according to the pitch. Make use of the pitch while selecting your team for fantasy leagues. From the above pitch report, you would have understood that keeping batsmen, spinners and seamers in your team would be a wise choice. In the morning, it will be a sunny day. From afternoon, it will be partly cloudy and mostly cloudy. The weather will remain the same throughout the day. The temperature is expected to be 16-Degree Celsius and the humidity to be 43%, which may rise up to 61%. The average first inning score of this ground is 238. The average second inning score of this ground is 171. Highest total on this ground is 307/5 in 50 overs by ENG vs NZ. Lowest total on this ground is 99/10 in 26.1 overs by SL vs ENG. England has defeated Australia back to back in last four games. In the last five games, AUS has won only one game out of five games whereas ENG has won four matches out of five matches. Eng has defeated Aus by 242 runs. This was a huge loss for Australia. In India and its sub-continent countries like Afghanistan, Maldives, Sri Lanka, Bhutan, Bangladesh, Nepal, and Pakistan, Sony Six and Sony Six HD has all the exclusive rights to broadcast the live coverage of Australia vs England (5 match ODI series and only T20 Match). The matches will also be streamed live on Hotstar Digital Platform (Website and Application). Justin Langer the coach of Australia has shown some interest on Nathan Lyon and he could play the 4th ODI. As Andrew Tye was very expensive in the last couple of games. He may have to sit in today’s match. Alex Carey may play as a batsman. Travis Head, Marcus Stoinis, Glenn Maxwell, Ashton Agar/Nathan Lyon, Kane Richardson, D’Arcy Short/Alex Carey, Shaun Marsh, Aaron Finch, Tim Paine (capt & wk), Jhye Richardson, Billy Stanlake. Tim Paine (c), Alex Carey, Kane Richardson, Nathan Lyon, Ashton Agar, Aaron Finch, Marcus Stoinis, Shaun Marsh, Jhye Richardson, Andrew Tye, Glenn Maxwell, D’Arcy Short, Travis Head, Billy Stanlake, Michael Neser. Although England has won their last three matches, they are not taking any match with ease. The decision of including Craig Overton and Sam Curran in the squad clearly shows this. Morgan has hinted that due to their hectic schedule, they may try their bench. As Jake Ball and Tom Curran were in the squad. They may get a chance to play today. Jonny Bairstow, Joe Root, Jos Buttler (wk), David Willey/Jake Ball, Adil Rashid, Mark Wood/Tom Curran, Jason Roy, Alex Hales, Eoin Morgan (capt), Moeen Ali, Liam Plunkett/Jake Ball. Jos Buttler (VC), Joe Root, David Willey, Eoin Morgan (c), Sam Billings, Mark Wood, Craig Overton, Jake Ball, Moeen Ali, Alex Hales, Adil Rashid, Sam Curran, Tom Curran, Jonny Bairstow, Jason Roy, Liam Plunkett. Fantasy Cricket Tips: You can select Jos Butler above Tim Paine as Butler is in good form. 80.55% of the users have selected Butler in their Dream11 teams and 19.45% of the users have selected Tim Paine. Make a combination of the above players for multiple teams. Fantasy Cricket Tips: The above players are most likely to score runs today. Make a combination of the above players for multiple teams. Fantasy Cricket Tips: The above all-rounders are most likely to contribute with the bat and ball. Make a combination of the above players for multiple teams. Fantasy Cricket Tips: The above bowlers are most likely to take wickets today. Make a combination of the above players for multiple teams. Fantasy Cricket Tips: The above players are most likely to perform today. You can take them as a captain and vice-captain. You can also take captains from key players. Fantasy Cricket Tips: The above players have performed in the previous matches. You can take them as a captain and vice-captain. Try to make a combination of 7-4. Take seven players from the home team and 4 players from Australia Team. Adil Rashid and Moeen Ali are must have players in any teams. Try to keep seamers in your team. Conclusion: This is it for Today’s Dream11 Fantasy Cricket Match Prediction of ENG vs AUS, 4th ODI Match, which will be played on Thursday 21st June. We have covered all the details required to win any fantasy leagues. We have covered players recent and past performance, dream11 guru and crictom prediction, all the latest news and updates of Australia Team and England Team, weather report of Nottingham, dream 11 best teams, keys players, the best choice for captain and vice-captain, where to watch the live match of AUS vs ENG, 4th ODI and the details of live streaming of Australia tour of England, 2018.